Raita (click on the link for the traditional version) is an Indian condiment made with yogurt. It is paired with a lot of spicy dishes like biryani, tandoori chicken or vegetarian cutlets because dairy products have a cooling effect when food is extremely spicy. If you follow Ted Allen's show, Food Detectives, you've probably seen the premier episode which asks "What is the best way to cool your mouth after eating spicy food?" After some experimentation it was clear that dairy was the most effective. This particular recipe is my take on traditional raita. Similar to the Greek sauce called tzatziki, I add dill, lemon, and olive oil. Being French, I also add some Dijon mustard to add some more complexity to the flavor. I know, some people are going to balk at my additions, but I think that sauces are the highlight of a meal, so why not enhance them with a lot of flavor? Sometimes I also add cilantro or dill, depending on what's available in my garden. I'll try to post the traditional recipe soon so that you can make your own variations to your taste. Combine all the ingredients in a bowl until the texture is smooth and creamy. Garnish with onion and mint. I served kitcheri with raita. It was a nice complement to the rice dish. I use Fage brand yogurt. I find the flavor to be richer and the consistency to be denser than the regular one. If the raita is too thick though, you can add up to 2 other tablespoons of whole milk. The whole Thai bird chile is in the raita just for garnish and brings absolutely no spiciness to the sauce as it is not chopped. I used pickled garlic for a milder flavor. You can find it any Asian market. Check out my cutlet recipe (click on the photo for the recipe). 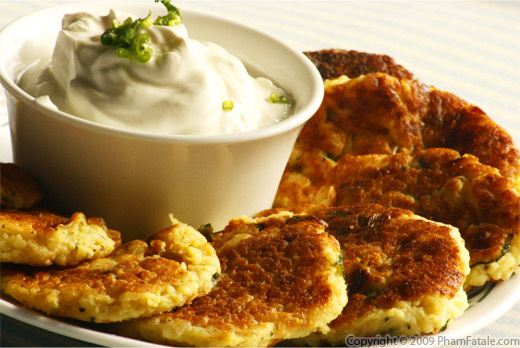 They are similar to potato latkes and go very well with raita. Published By: Jacqueline Pham on July 19, 2009. I love the humble raita. Its a simple side dish we Indians like to complement spicy dishes like Biriyani, but you've made it a bit more global with your enhancements :) Nice. If you haven't heard of it, I'd recommend trying your hand at pineapple raita too- its wonderful! I think I would like to try it with the dijon. I love Raita but am never quite happy with the results when I make it. Your recipe sounds fabulous and I will most definitely try it. I love any yoghurt based sauce. The raita looks delectable and beautiful photos, as always. I love the additions you've added to the raita, they would make it fantastically tasty!! I will try and remember to add some of these the next time I make some. youe pictures look perfect and it make a good combo with a khichri...we like aam ka achar too with this combo..
i loooooove tzatziki, so i think your additions make this supremely appealing. the mustard is an interesting touch, and as much as i enjoy the yellow stuff, i’m certainly willing to give it a try ifiI ever get inspired to make a yogurt sauce! I only use Fage for raita, tzatziki, or any yogurt based sauce. It's just so much better! I love your fusion flavors! As you may have guessed from my cucumber ice cream topping, cucumber with yogurt is a favorite combination! Your fusion raita is just the thing for the grilled lamb that my husband loves so much! Love the fusion concept you've employed here. French + Indian is such an interesting mix. Also changing ingredients and coming up with new combinations is part of the journey of food, it's been happening for thousands of years as humans have migrated from one place to another, so there's nothing wrong with that. Try ripe Thai chili for a nice color infusion!